Kerlson Pines stud, Keith, enjoyed a clean sweep of the major ribbons in the Poll Hereford judging. 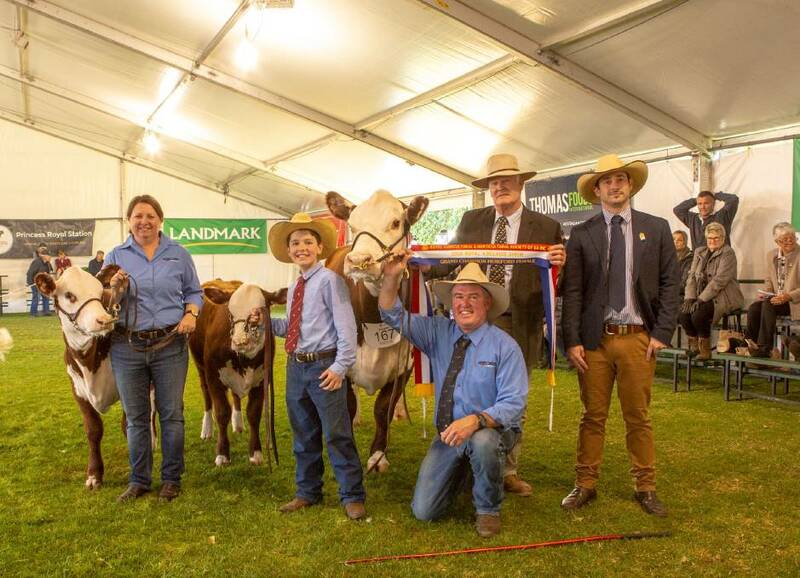 The stud has been showing at Adelaide for about 30 years and while they have won numerous broad ribbons it was their first grand championship double. Judge Tom Green, Tintinara, heaped praise on his senior and grand champion female, Kerlson Pines Regal L74, a magnificent first calving cow with twin heifer calves, exhibited by Mark and Anita Wilson and Stuart and Val Adlington. “As an individual the cow was pretty special being a first calver,” he said. The six and a half month old calves were sired by Mawarra Ohio L416 – a $36,000 bull which Kerlson Pines owns in partnership with fellow SE stud, Oakdowns stud. The senior and grand champion bull, Kerlson Pines Regal L74, turned plenty of heads including the judge for its weight for age, weighing 702 kilograms. “That raw power but still mixing it with a lot of functionality has put him to where he has ended up today,” Mr Green said. Regal had a proven pedigree being an ET-bred son of Kerlson Pines Last Day 115 and Allendale Anzac H181. Its maternal brothers have sold to $22,000 at the Dubbo National Show & Sale this year and a full sibling was the grand champion female at last year’s Royal show. “We will use him after Adelaide over a few cows and he will either go on to Dubbo or Wodonga (bull sales),” Mr Wilson said. Both junior and reserve junior champion females came from the biggest class of the day, the 10-14 month class. Mr Green described them both as classy, complete young heifers but gave the nod to Kerlson Pines Annie N105 for junior champion. “There wasn’t much in it with their balance of length, head carriage and muscle expression,” he said. Mr Wilson said it was special to also win junior and reserve junior champion heifers. “The line of cattle was really consistent in quality and type – we were lucky the judge liked them today,” he said. Although the numbers were low Mr Green who is involved in his family’s Yarrandabbie Poll Hereford stud in NSW commended the breeders for the “quality and consistency” of the 17 head. This story originally appeared in the Stock Journal HERE.